Twist Face: and/or Graduated Roll Technology? Twist Face is bulge and roll that’s been rotated, tilted, or otherwise twisted. It’s still bulge and roll, but with a literal twist that gave the oversized face inserts a shape that resembles a Pringles potato chip. 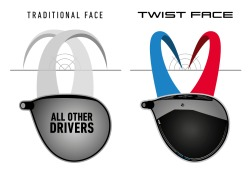 So what about TaylorMade's Twist Face? When a driver gets tested on a robot, shots struck on the toe and the heel of the face almost always arc back perfectly towards the center of the fairway, because of gear effect. Here’s where the difference between robots and humans comes into play. Humans don’t swing like robots; when you set a robot up for toe and heel contact, it still puts the same swing on the ball. With humans, heel and toe contact often results from changes in other variables (path, face angle, attack angle, etc.). Golfers aren't robots, robots aren't golfers. When a real golfer hits a shot on the toe, he often has swung from the inside out, and a common outcome is a low spinning pull hook. With Twist Face, instead of being more or less straight relative to the face, the bulge and roll is twisted from high toe to low heel. Nothing looks out of the ordinary at address, however, with Twist Face, the club face is effectively more open in the high toe area and will present more loft. In theory, this means a shot will start farther to the right of the target, launch higher, and curve its way back closer to the center of the fairway. For most drivers, the consistent curve from heel to toe (known as the bulge) and crown to sole (roll) counteract the negative effects of spin and launch on miss-hits. However, as TaylorMade began to cull through a mountain of data, it noticed the bulge, in particular, was not designed in a manner that benefited the two most common misses for the average golfer. TaylorMade found that, with traditional bulge, shots stuck high on the toe had a tendency to curve back too far to the left of center (8 yards), while shots that found the low heel tended to curve back too far right of center (6 yards). The average amateur tends to swing outside to in with a closed face on high toe shots, and do the exact opposite when it comes to shots that strike the low heel. TaylorMade's new M3 (replacing M1) and M4 (replacing M2) drivers is a twist on bulge and roll. The technology works in a way that the face curves more open slightly above center moving toward the toe. The exact opposite occurs in the bottom portion of the face where it curves more closed below center toward the heel. The goal behind the curvature adjustments is to keep the ball online on off-center strikes. According to TaylorMade, Twist Face reduces mis-hits high on the toe from 8 yards left of target to 1 yard, and 2 yards right of target instead of 6 yards on low heel strikes. CONCLUSION: With TaylorMade’s extensive testing with not only robots but also lots of humans, one can’t argue with their stats, only time will tell! One of the first Podcasts of 2018 appeared recently from ME AND MY GOLF, where Brian Bazzel, Vice President of Product Creation for TaylorMade goes into a good narrative on their new product. Take note near the end, where he makes a statement proclaiming that future drivers from TaylorMade will all have the FACE. GO HERE. To understand the concept of graduated roll technology in driver face design, we must first look at what has been standard vertical roll in heads over the years. No such reason has ever been explained for the presence of ROLL. Yet all wood heads have been made with vertical ROLL radius since the beginning of the 20th century, until Tom Wishon, in the middle 1990’s started incorporating his graduated roll technology into his driver heads. 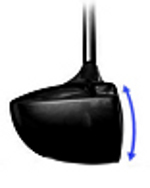 When the face on to-day’s drivers carry a vertical curvature, the loft angle at the top of the face is greater than the designed loft of the head, and less at the bottom of the face. 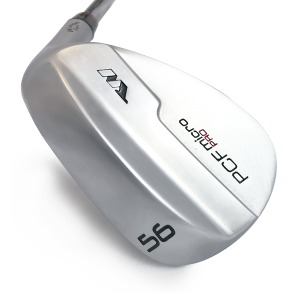 As driver heads have steadily increased in size from the mid 1990s, face height has also increased greatly. Yet the vertical roll radius for all other golf equipment companies has not changed during this time. 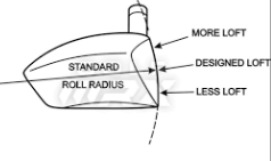 As per the above image, the conventional vertical roll radius on today’s driver’s shows that for an 11 degree loft driver with a typical 12 inch vertical roll radius over a 55 mm face height, the loft at the top of the face will be 14+ degrees and 8- degrees at the bottom of the face. These dramatic loft changes can have the effect of causing the launch angle for shots hit above or below the center of the face to be very inconsistent-too high for high face impacts, and much too low for low impacts. However, have a look at Wishon's graduated roll (GRT) face. Do you see anything different? Tom Wishon, of Tom Wishon Golf Technology, in the late 90s and early 2000s, started to study new head design, in specific, changing the vertical roll. He observed that with many golfers, high face hits were resulting in launch angles + trajectory flight that was too high and low face hits were resulting in launch angles + trajectory that were too low for the shot to be close to optimizing for distance for golfers. From all of his observations, he developed the concept to change the vertical roll design of a typical large size (460 cc +) driver head. 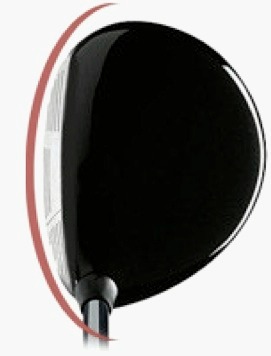 Initially he designed a driver prototype with a flat face from the bottom of the face up to a point about 2/3’s of the face height-from there up to the topline, he incorporated a 15” roll radius- some roll, but less than what the typical driver face radius was at the time for all other companies. Thus, graduated roll technology was born. From hit testing using both human golfers and robot hitting, he found that the GRT face provided some very interesting and very positive shot results for the vast majority of golfers and swing differences. High face hits flew perfectly well for the full variety of swing types and all head speeds. For swing speeds up to 115 mph low face hits resulted in better flight and better overall distance than did the same low face hit on a driver made with the typical 9-12” roll. For swing speeds over 115 mph it was observed that the launch angle and spin from the 0 roll bottom of the face could get too high and cause a slight beginning of a ballooning flight shape that would rob total distance. He therefore slightly modified the previous flat lower face into a slight 20” roll radius. The entire goal of Tom Wishon’s graduated roll technology in the face design of driver heads is to eliminate the inconsistency of how the vertical roll radius will change the loft angle up and down the face. In the end there has been thousands of positive comments from golfers and club makers about the real world shot improvements noted from the graduated roll technology on Tom Wishon’s driver heads. So, Twisted Face or Graduated Roll Technology? So, has TaylorMade come up with the next great technological invention in driver head design? Twist Face has merit, even though it may not be revolutionary, but using Wishon graduated roll technology, the overall dispersion of your drives can improve immensely, without the enormous difference in price. YOU KNOW, MONEY AND TIME SPENT LEARNING HOW TO HIT YOUR DRIVES ON THE CENTER OF THE FACE WOULD BE YOUR BEST CONCLUSION?????? For some really entertaining info on the new Twist Face go to You Tube and type in twist face in search. It’s getting real interesting.